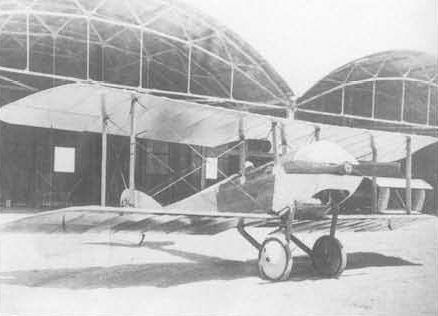 The first biplane made by the firm, produced in any numbers, was a small single-seater scout, similar in layout to the Sopwith Tabloid and Bristol Scout. Delivery of eleven aircraft was made to the RFC by the end of 1914, and production continued well into 1915. The machine was a single bay biplane with ailerons on all wings. The early examples had a robust undercarriage of four struts and twin skids, with small wheels at the tips of the skids. The aircraft rested on the rear of the skids when on the ground. Later the undercarriage was changed to a conventional vee type with tail-skid. A peculiar feature was the use of external joint plates for the strut connections. A Lewis gun could be mounted on the top central section, some aircraft being so fitted in the early war years. Power: 80hp Gnome seven-cylinder air-cooled rotary. S.1. 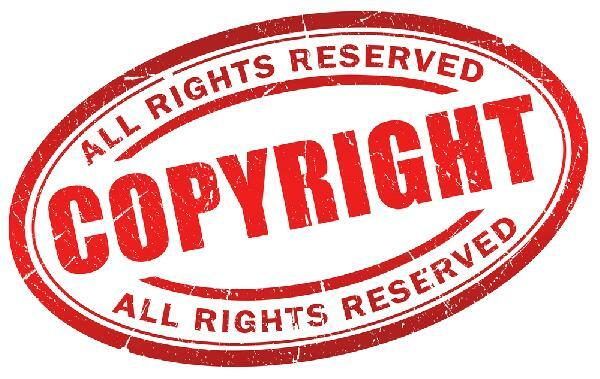 'In my eyes,' recorded Capt L. A. Strange of this single-seat scout (built 1914), 'all defects were outweighed by the fact that it had a Lewis gun mounted on its top plane, which could be fired forward and upward.' The installation mentioned was made in the spring of 1915, and it was during May of that year that Capt Strange had the historic experience of saving his life in an inverted spin by hanging on to an ammunition drum which had jammed on the gun. Concerning other forms of armament, specific details are lacking, but rifles were carried, and for Home Defence the following loads have been mentioned in connection with a 'Martinsyde Scout': '6 Carcass bombs (3.45-in R.L. tube for discharge); 12 Hale Naval grenades; 150 incendiary darts; carriers for five powder bombs.' Small bombs were apparently carried for attacking ground targets, and an S.1 of No.5 Squadron (Capt G. I. Carmichael) was adapted to take a 100-lb bomb, sighted through a hole cut in the floor. Previously provision had been made for 20-lb bombs under the wings. 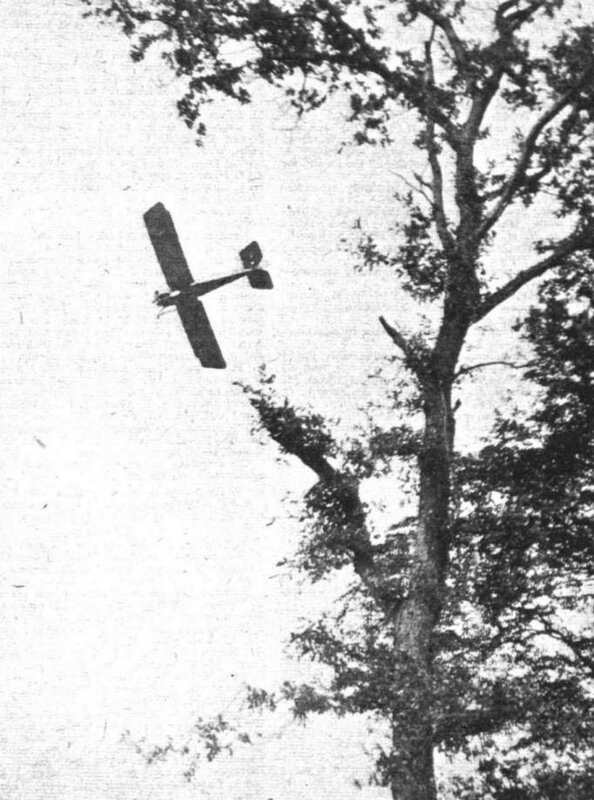 Late in 1914, the firm produced a small fast, biplane "Scout," with an 80 h.p. Gnome motor, which was an immediate success, and was promptly ordered in large quantities by the War Office. It played an important part in the war in 1915, till the increased speed of the German machines rendered it out of date. It was superseded by a more powerful type of Martinsyde scout, fitted at first with a 120 h.p. Beardmore engine and later with a 100 h.p. Beardmore. Martinsyde SI single-seater scout biplane of 1914 with early-type undercarriage. A Martinsyde S.1 Scout with 80 h.p. Gnome engine, and later with 100 h.p. Monosoupape Gnomes, one of the most sucessful small fighting machines of the 1915-16 campaign. "DOING SOMETHING FOR MOTHER." - Mr. Sykes on the Martinsyde making a heavily banked turn over the trees at Hanworth Park on "Mothers' Day." 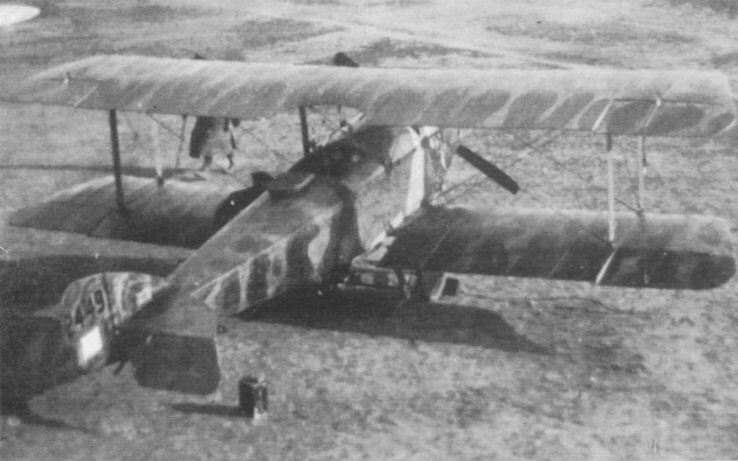 Camouflaged Martinsyde S.1 '2449 of 4 Squadron at St Omer in early 1915. Martinsyde SI with the later V-type undercarriage. Clearly influenced by the success of the Sopwith Tabloid and Bristol Scout, the Martinsyde S I prototype unarmed single-seat scout emerged during the late summer of 1914. Initially, the S I had a clumsy-looking four wheel landing gear, happily replaced by the time this machine, serial no 4241, was photographed. With an 80hp Gnome rotary, the S I's top level speed was 87mph at sea level and its performance was generally considered inferior to both of its illustrious forebears. Only 61 S Is were built, with deliveries to the RFC lasting for about a year between late 1914 and October 1915. Never to equip a complete squadron, S Is were used by five French-based RFC squadrons, plus another RFC squadron in Mesopotamia. Martinsyde S.1 Scout '4250. This was one of the first single-seat scout (fighter) types to serve with the RFC and first appeared in early 1915 as air combat was becoming of increasing importance. Armed with a single Lewis gun on the upper wing, the S.1 was used only in small numbers and was not a great success. The campaigns in the Middle East continued to include air participation, albeit still on a small scale but often with decisive results. This Martinsyde S1 ('4250) is pictured at an unknown airfield in Egypt where it was probably in use for training. 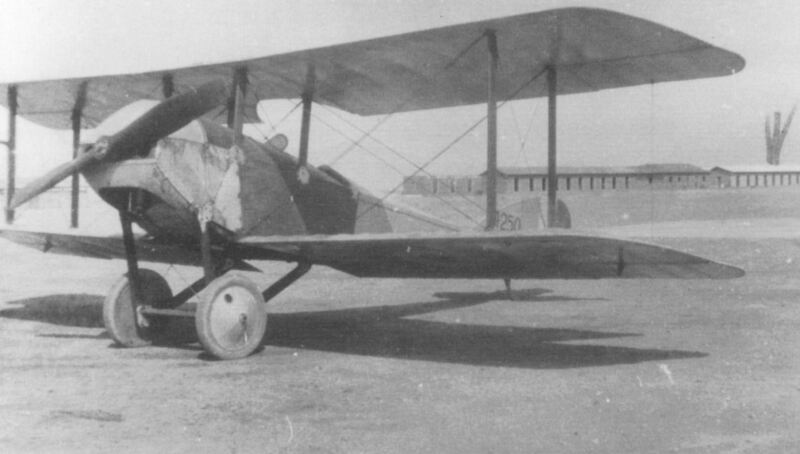 However, the 30 Squadron detachment in Mesopotamia had used two of this type with some success and this aircraft may have been destined for the same unit. 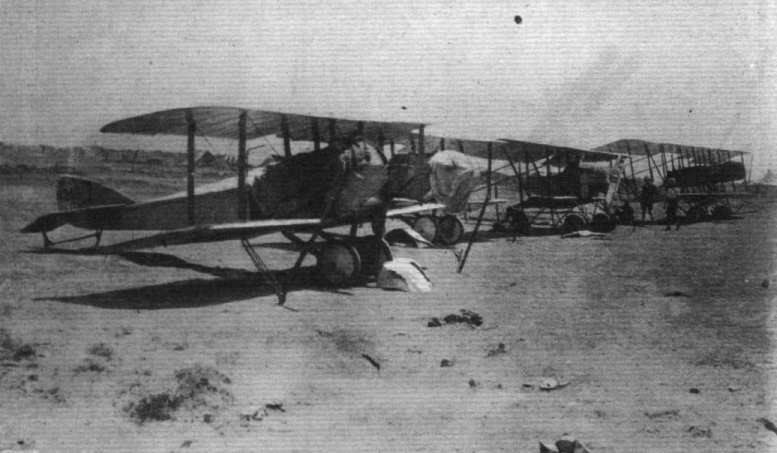 The first aeroplanes in the campaign in Mesopotamia where they have been used for carrying supplies to General Townshend's forces besieged in Kut.